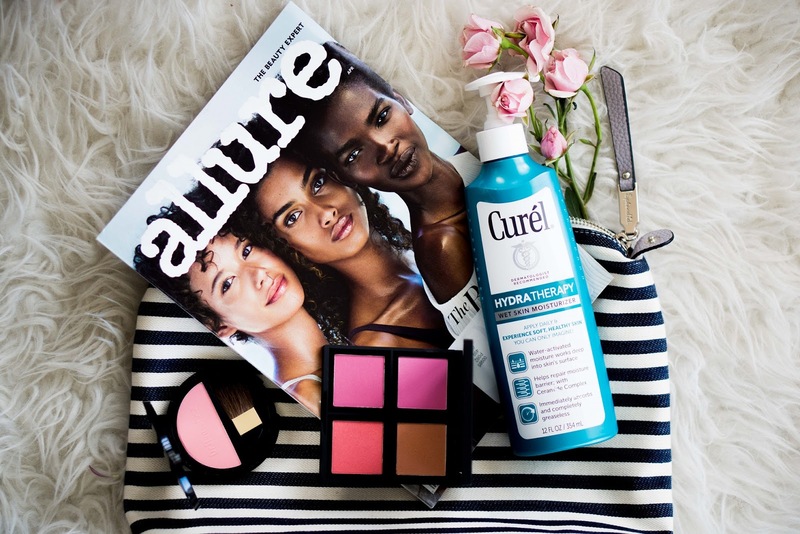 Remember when I told you all that I was switching up my lotion game by adding the Curél® HYDRA THERAPY WET SKIN MOISTURIZER to my daily routine? Well, I've been using the moisturizer after showers to really seal it in for my dry skin. That's the best benefit of a wet skin moisturizer after all. 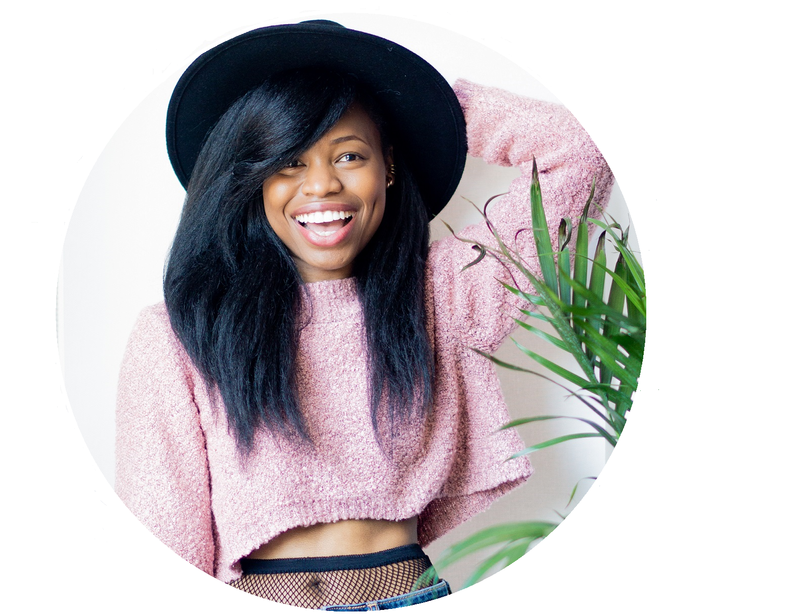 So now that it's been almost a month, I wanted to follow up on my routine and share a few other tips for spring skin care. My skin has seen some good changes in the past few weeks. 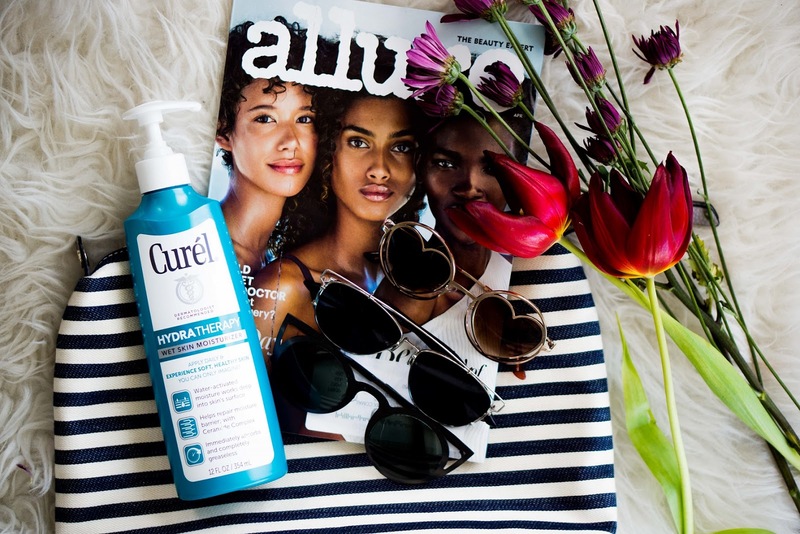 The fact that the months have gotten warmer and I've been using the Curél® HYDRA THERAPY WET SKIN MOISTURIZER have really elicited a smoother, more even tone on my skin all over. Initially, it did seem weird to apply the moisturizer on wet skin, but the process was easy to get used to quite quickly. It actually felt better on my skin as I could feel it absorbing nicely. I wouldn't say that I no longer have any dry skin (I have eczema so I doubt that'll ever be the case), but I have seen improvements in my problem areas. For one, it was non-greasy. And for two, it lasted pretty much all day long. 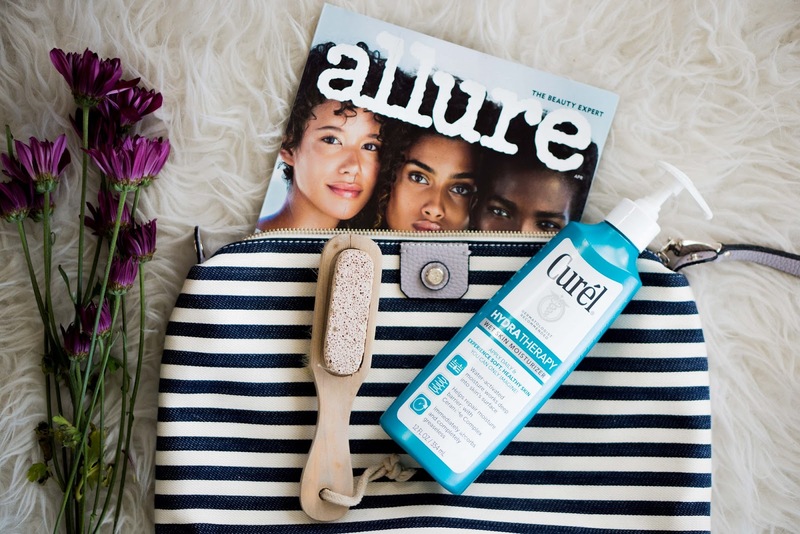 Apart from my Curél® skincare, there are a couple other ways that I've decided to help end dry skin this spring. 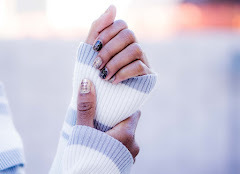 EXFOLIATE: If you know anything about dry skin, then you know that exfoliating is key. You slough off dry skin and dead skin cells by gently exfoliating to restore a fresh glow. With the Curél® HYDRA THERAPY WET SKIN MOISTURIZER, you can feel free to use it daily. But be sure to only exfoliate once or twice a week. APPLY SUNSCREEN: We tend to always remember to apply sunscreen in the summer, but it's good to make it habit year-round, even in the spring. Using a sunscreen on your face (SPF 30 or better) can keep your skin smooth and protect it against harsh elements that could aid in drying out your skin. KEEP MAKEUP LIGHT: No one really likes to lay on heavy makeup because no one likes a cakey look. But heavy makeup can also clog pores in the dry areas of your face. During the spring, opt for lightweight foundation (or just a tinted moisturizer) if possible. PROTECT YOUR EYES: Spring time also means that it's sunnier out, which is a good thing. But more sun can mean more squinting, and squinting can cause fine lines and wrinkles. Protect the delicate skin around your eyes by investing in an eye cream with a high concentration of antioxidants and peptides. Or, better yet, buy a nice array of sunglasses! Glad you are a Curel fan! I could probably use this right now. I went to the beach over the weekend and it seems like I need to soak and get my dry skin some hydration... but i dont think my local stores carry the brand.. I like the beach but it always makes my skin dry. 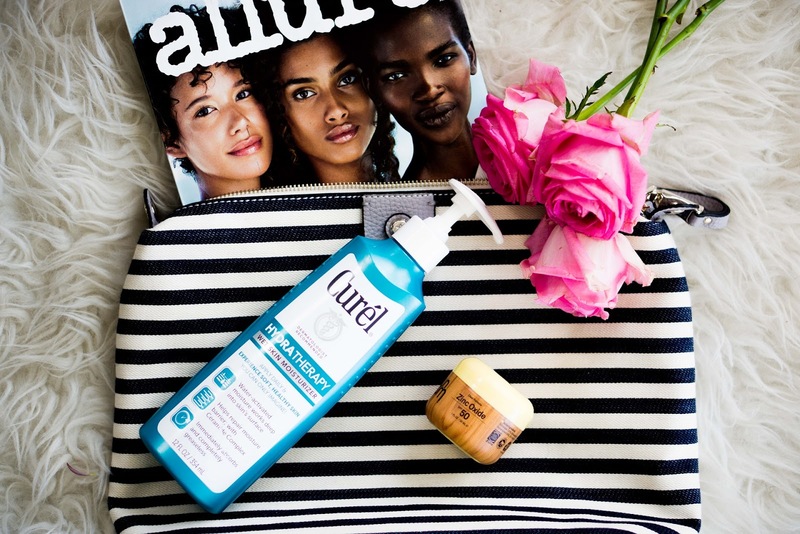 Curel would be good to use afterward -- any moisturizer would be good. Is this stuff really thick? I love a good thick moisturizer! I need that Allure, like NOW. I think that I could really benefit from this product. Love Curel! I really like the sound of this product! I definitely want to try this out! Want to tryyyyy this! Great way to add in another moisture session- I have dry skin, too, so I'm always looking to hydrate! I really like these wet moisturizers, really helps with keeping your skin moisturized! I need to get this pronto. My aging skin needs it. Thanks Dear!